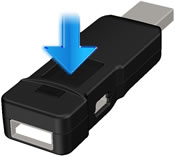 Firmware recovery mode allow redo the firmware update after an updating fail (e.g. bad USB cable, power loss), causing the Titan One not work properly. Internet connection is required to update the Titan One firmware. With the Titan One device connected to the computer through the PC PROG port (mini-USB cable), open the Gtuner software. Press the reset button on the back of the device with a paperclip until you get a "P" on display. On Gtuner software open the "Tools" menu and click on "Firmware Update". Follow the wizard steps until the end, it will program a recovery firmware in your device and close the wizard automatically. The Gtuner software will then recognize a device with recovery firmware and ask to do the update to the latest firmware available.